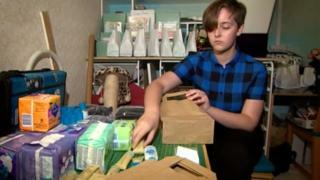 A teenager who campaigned for free sanitary products in schools says it is "just brilliant" council bosses have backed her. Milton Keynes Council will provide tampons and sanitary towels to schoolgirls to tackle period poverty. It is the first local authority in England to do so. The Scottish government launched a similar scheme last month. Paige Pilkington, 13, spearheaded the "Girl Pack" project in March. She had noticed her friends were skipping school during their period and began giving out her own products for them to use. The Milton Keynes Academy pupil then started distributing free sanitary towels, wipes, underwear and hand sanitiser to food banks, community hubs and six schools, before bringing the issue to the attention of former mayor, David Hopkins. Councillors agreed on Tuesday to support the campaign to help girls from low-income families by providing sanitary wear in schools. "My friends said 'thank you for doing this, it's what we needed'," Paige said. Conservative group leader Alexander Walker said Mr Hopkins had made a "passionate argument for ending period poverty" in the town. "Many girls were not going to school just because they were on their period... and we thought it was something we needed to pick up," he said. "I'm sure Milton Keynes can lead the way and start the debate nationally." He said the next stage would be to look at funding and have the project running by next year. Paige said she will continue to work with the council, which said it hoped to eventually offer products in all public buildings. "I now want to work with councils all over the country to see if they can do the same," she said.